That tranquil Monday spent at IMF looking for Blackwits seems a long time ago. No matter how grounded you are, no matter how much perspective you have things can get a little hectic, sweeping you along, throwing you off kilter. My mind has been occupied in a hundred different directions this week and it has left me a little bewildered, unfocussed and unable to write anything for the blog. The space between my ears cluttered up with nonsense and trivia. I needed something to slow me down, to oil the cogs and gears of my brain. They seem to be grating on each other, dulling my senses, stalling my creativity. Recently I haven’t been able to “see” a picture neither could I describe a place, a thing or a feeling. In an effort to shake off the creative shackles I head over to Hilbre Island early on the morning of a roaring westerly gale. At this time of year there is a good chance of passing Leach’s Petrels being blown close in to the island, close enough to photograph and I’m hoping that will do the trick. 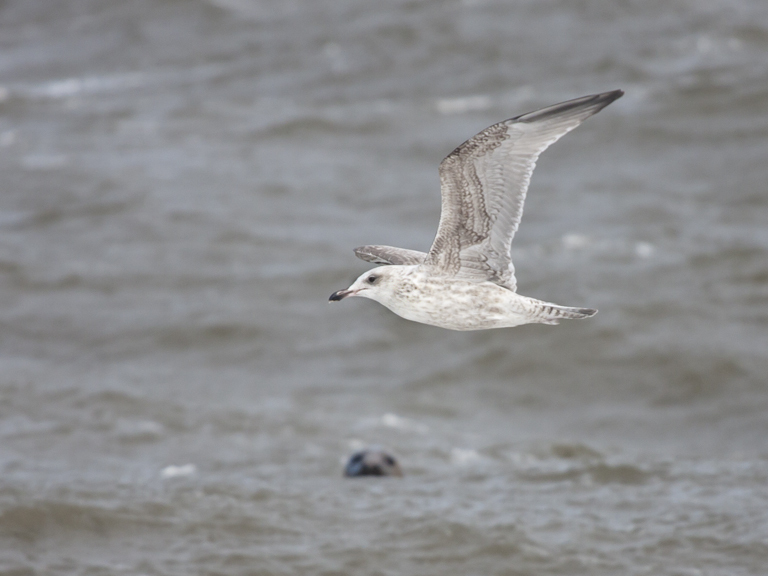 I remember a similar day a couple of years ago producing a big number of these seabirds at close quarters. I’m mindful too that last year a bubble of “photographers block” was burst on the rocks that I am headed for now. The wind buffets my body like the pointless, unreasonable, fiddly tasks that have been buffeting my mind and despite my efforts to leave these distractions on the mainland I still feel nagged by them, like they are chasing me across the sands. Perhaps I’m putting too much pressure on the Patch, I can’t expect it to ease my mind, and after all it is just some mud and rock. It is impassive to the lives of those who occupy it. It just exists, whether calm or stormy. It just…is. As I arrive on the island the wind, strengthening since first light, is now a full gale gusting to storm force. It creates a scene filled with noise and drama. The sea is being shredded by the storm. Navigating this looks impossible but the Grey Seals seem quite unperturbed. 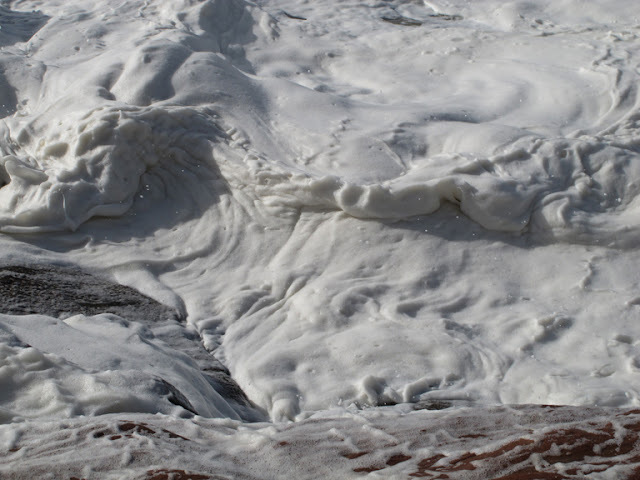 Wave tops are being broken by the wind before they reach the shore, all along the gunmetal grey water are white foamy lines pointing shorewards. When they do hit the island they come right over the north end making the normally pleasant walk from telegraph station to lifeboat slipway a soggy and hazardous feat of endurance. The water splashing the rocks is whipped to an egg-white like foam resembling an uncooked meringue. Loose and bubbly on my arrival it quickly forms into stiff peaks, looking silky and oven ready. Once in the slight shelter of the derelict boathouse I look to the sea expecting inspiration and Leach’s Petrels. I don’t get either. In the absence of the petrels I practice seabird photography on the gulls that are circling the tip of the island. The wind and the crash of waves is a cacophony of white noise, not what my fuzzed head need right now. 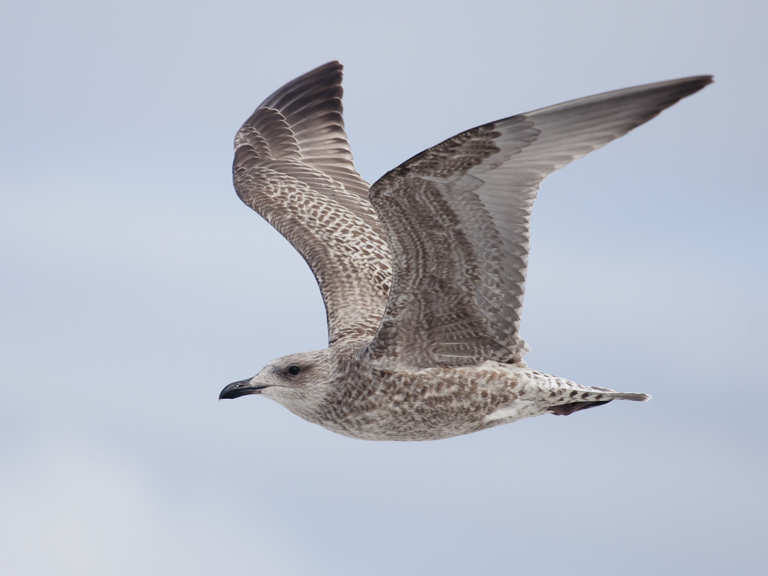 The only birds loud enough to be heard over the sea are the shrieking gulls, their calls harsh and discordant too. A couple of Manx Shearwaters careen by, too far for any pictures. Just the gulls remain in camera range. 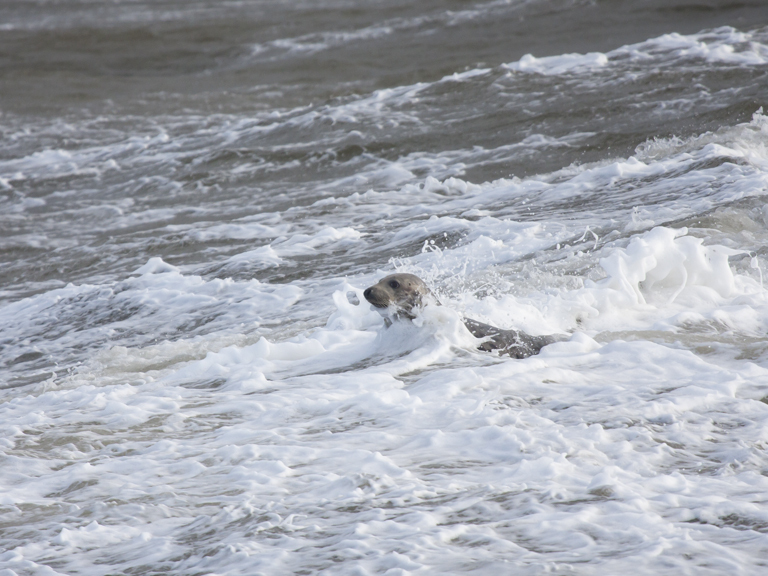 I continue to watch them, as do the seals. 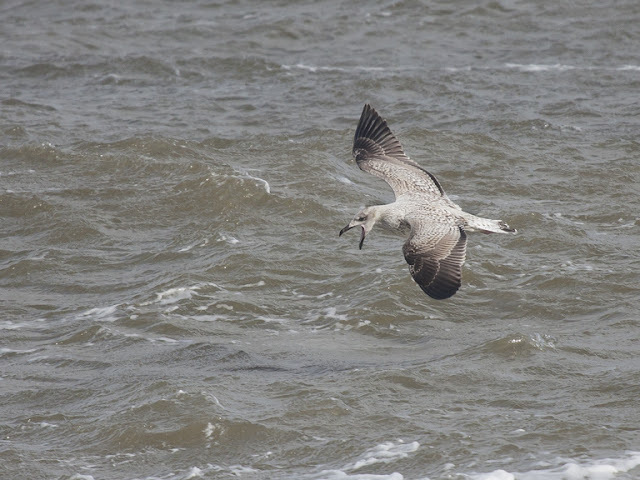 From the seawatching hide comes news of Skuas of several varieties well offshore. I see an Arctic Skua briefly harass an innocent Sandwich Tern, but the goodies are too far away for binoculars and a 100-400mm zoom lens so instead I record the gulls paddling the roiling plane of the water, running along the surface, some settling on it others attempting to take off without catastrophe. 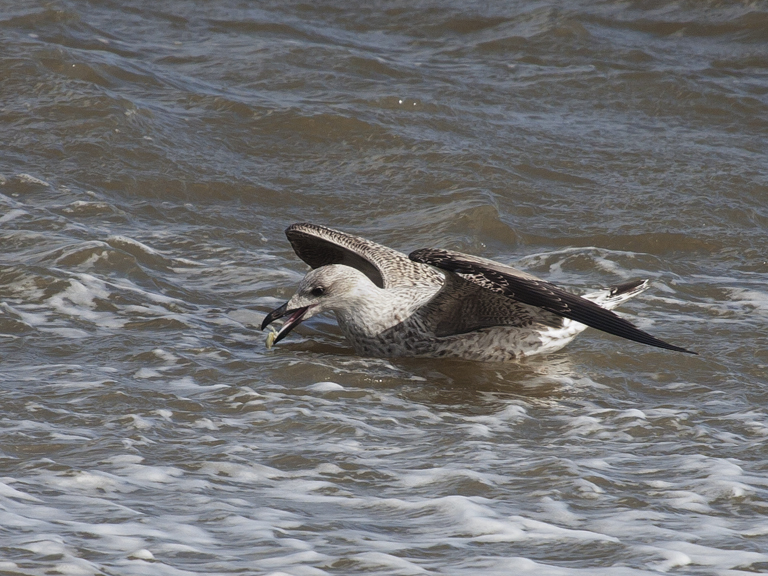 A Gannet zips by followed almost as quickly by another. I train the camera on them but the sun has come out and I haven’t adjusted the exposure for this, the resultant pictures are pleasingly sharp, but ultimately over-exposed, clipped beyond redemption and destined for the recycle bin. 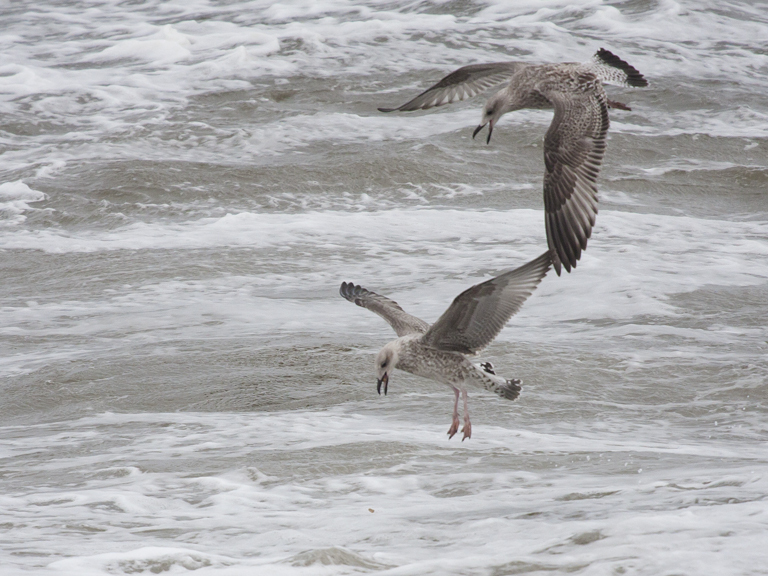 I turn my attention back to the gulls, some of which are now feeding. Whether on prey wrestled from the seabed by the gale or on passing fish it’s hard to tell, but either way they are filling up. The tide is starting to recede now although the fury of the wind is still raw and raging. I come to the conclusion that I am not going to get my Leach’s Petrel picture, and following the dropping tide, I leave the island. Back on the mainland I sit quietly indoors and reflect. I do not feel disappointed that I didn’t get the shot I was after. Slowly I realise that I had a spanking good time taking pictures of the gulls. Reviewing the pictures on the back screen of the camera a smile creeps across my face. I start to feel…. loose, steadied. Relaxed. 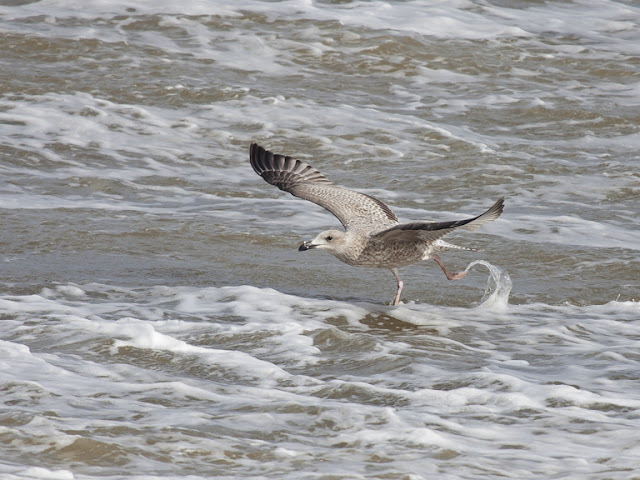 In the tumult of a Hilbre gale, that crescendo of wind and wave the Patch blew away my anxieties without me realising. That familiar feeling of focus hits me once more. The notebook comes out and I start to scribble ideas, feelings and facts about the day. I am ready to write again. That’s why I love the Patch. It works for me. It reassures me with its constant-ness, it’s lack of trivia and bias. It exists, it happens, it is happening now, I’m just indoors and can’t see it. I was out there, head battered by events on and off the Dee and now I’m steady again. It sorted me out subconsciously. Beautifully written entry and great pics.